“… il y a simplement trop de monde,” a French hiker exclaimed as we walked by, referencing the increasing number of visitors into the city and its alpine hiking trails. 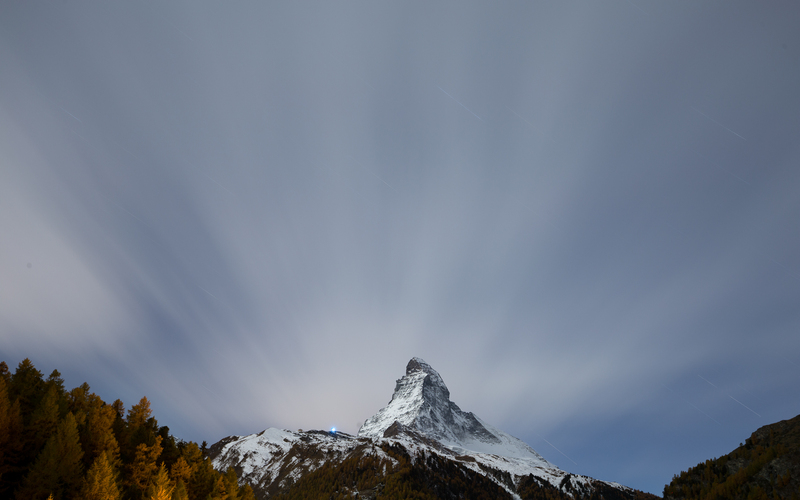 And it’s true — Zermatt, or its well known mountain, anyhow, is a huge tourist draw. Its visitors office estimates roughly three million gawkers pass through each year, on average spending over 200 CHF per day. But even the prospect of needing to consistently assert that I wasn’t going to be a train-riding visitor but rather a gung-ho hiker wasn’t enough to keep me from coming back a second time this month, cheating on Rainier be damned. This weekend ended up being largely about the Riffelsee. In 2011, almost down to the same weekend, I had also attempted to hike to the lake for sunrise. That time, I got lost. This time, I got up at 2:30 AM to give myself plenty of time to get lost and unlost. Nevertheless, even though the time of year was the same, the temperature and previous snowfall was far from: the trail was closed (I ignored the barrier and continued up the trail anyhow), and after 2100 m altitude without crampons the steep, icy uphill before Riffelalp became impassable. Rather than risk slipping in the dark, I turned around, frustrated, and headed back to the village. On a whim, I decided begrudgingly to contribute to Zermatt’s revenue by taking the train up to the Rotenboden station, about 600 m from the Riffelsee. The first train of the day this late in the season meant I would have just enough time to catch the sunrise at the lake. What a sunrise it was. 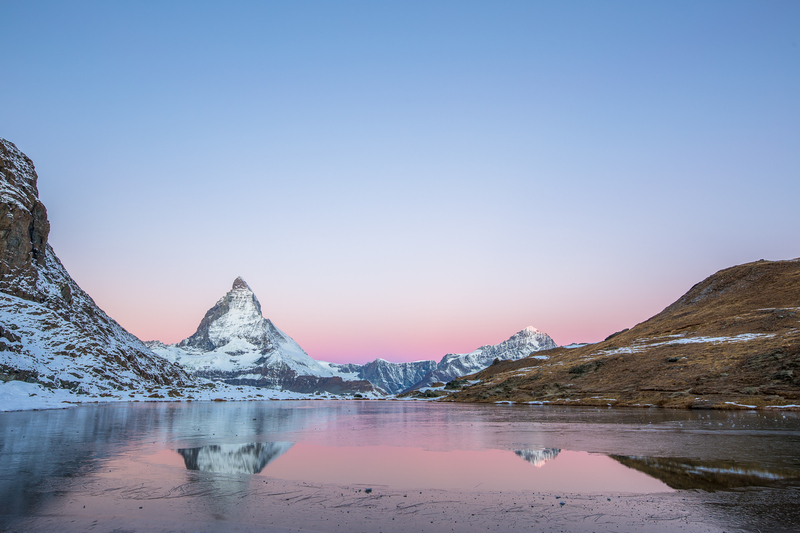 Even though the lake was largely frozen over and my toes and fingers fully understood why (other than the twenty minutes on the train I had been outside for five hours by this point), I stayed around to see if the Matterhorn would light. That it did not was hardly noticed. The next day, I took two visitors staying at the same airbnb up to the lake, and I hoped that the clouds in the sky would catch some good color. They did, but I was in a rush to get to the lake and rushed my photos of the color show that thronged the high mountains around the Zermatt valley (Mattertal auf Deutsch); maybe one day I’ll get around to posting them. I arrived at the lake too late to get those colors, though without them it’s easy to analyze the difference just one day can make — where the previous day (and photo) was cold and wintery, the scene on the second day seems almost warm. Temperatures were literally higher, too; the lake had thawed some, and the area of the unfrozen water was nearly twice that of the previous day. 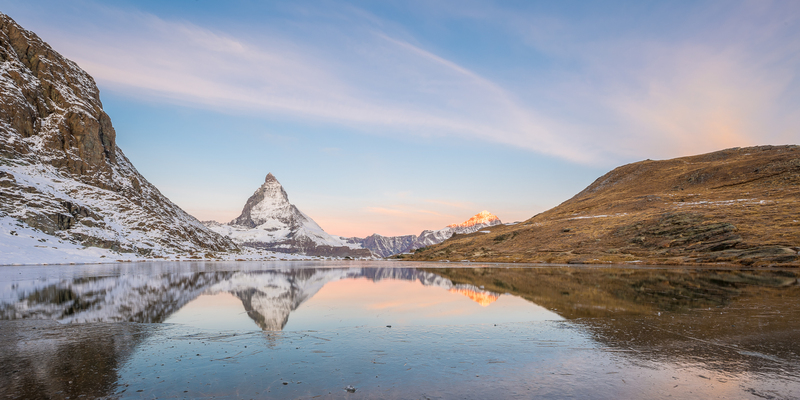 Going to Zermatt is not only about the hiking or the views, however. Another true delight is in the roads that lead there, my favorite still being the Furkastraße. Switzerland might be known for its Alps and its chocolate and its clocks and its army knife, but its road system is second to none. And they’re not just loved by car enthusiasts. 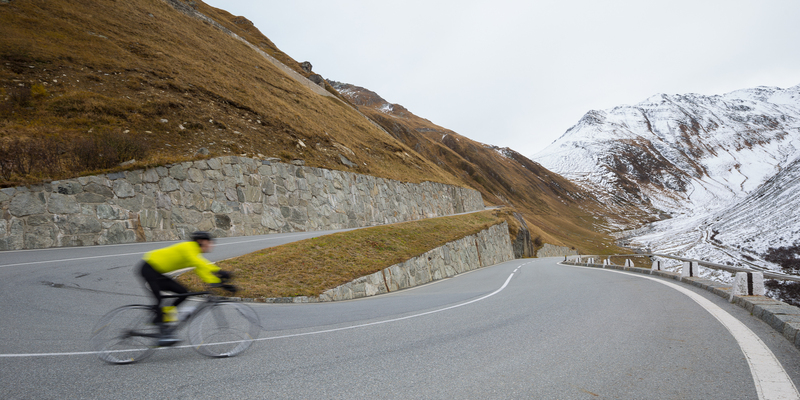 Bikers, too, welcome the challenge of 12% grades and never-ending hairpins. Even if Zermatt didn’t exist, these roads would be reason enough to pay the 40 CHF for the annual vignette. Last time, I wrote that Zermatt seemed to be on a brink of sorts, facing an identity bifurcation of needing to preserve the natural beauty in its alpine wilderness while still somehow granting millions unfettered access to that beauty. Twice now I’ve tried the Riffelsee hike from the city, and twice now I’ve failed to get there either in time or under my own power. Therein lies the irony. Even though I prevented myself from being fully independent in my quest to get to the lake on time, this trip I still was able to witness the incredible sunrises for the very reason — abundant tourism — that otherwise makes me scowl. Not a weekend too soon, I should add; daylight savings time ending on Sunday morning meant that the train would be one hour too late for sunrise for the rest of the season. The very industry that clogs the streets and builds a dozen new buildings in the city each year also funded the vehicle that allowed me to witness that which most people can’t. Although I had every intention to experience this separately from the machine, even I succumbed and chose seeing the lake over giving up on the shot altogether. Is, then, too much tourism such a bad institution? It’s hard to articulate concisely the exaltation of a proper sunrise experience. A long hike rewarded at its conclusion by an unbelievable, jaw-dropping sunrise is an experience I’ll never forget, and one that I will try to repeat. In the next years, you can bet I will try this hike again, and this time I’ll bring the crampons or the snowshoes — regardless of whether mechanized transport is available. I have found I am more of a “sunset” person. The crack of dawn is, well, very early! Good for you my young climbing & hiking friend. The “hills” of Lisbon suited me well.